Well it is only February! There is an outfit called the 2011 Trust who look to celebrate the 400th anniversary of the King James Bible. Their ‘About Us’ blurb goes as below. 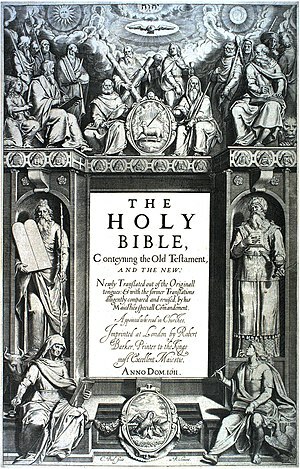 The 2011 Trust has been established to celebrate the 400th anniversary of the King James Bible which was completed in 1611. There have been few more important single publications and its impact through history has been colossal. Our aim is to celebrate its impact in history and on language, particularly in this country, but also throughout the English speaking world. 2011 will be launched at Hampton Court, where the translation was commissioned at the 1604 Conference. The year will close on 16 November 2011 with a service in Westminster Abbey where, in the Jerusalem Chamber, the final editing of the Bible was completed. I hope that you will find something of interest in our plans. I would be delighted to hear from you if you have any ideas. Our website will be constantly updated and please do sign up to our mailing list. All well and good and I wish them well. The King James Bible is for me the easiest to read and understand of all the modern translations. There’s just something about the thees and thous and words seemingly the wrong way round that, well sort of makes sense. At least to me. “it is important that religion should not be allowed to hijack this cultural resource”. Too true Dicky, gotta keep them religious away from the KJV! You couldn’t make it up.